The Whitworth University Board of Trustees announces that Beck Taylor, Ph.D., has been appointed the university's next president. He will assume his duties July 1, succeeding Bill Robinson, who is stepping down after 17 years as president. Taylor currently serves as dean of the Brock School of Business at Samford University, in Birmingham, Ala.
"The Whitworth University Board of Trustees is excited to announce the appointment of Dr. Beck Taylor as Whitworth's 18th president," says Board Chair Walt Oliver. "We are confident he brings the vision, experience and clear commitment to Whitworth's mission that will move the university forward in exciting ways. This is a great day for the entire Whitworth community." Taylor, 40, was unanimously recommended to the board by a 14-member presidential search committee including trustees, faculty and staff members, and alumni, community and student representatives. Anne Storm and Jim Singleton, members of Whitworth's board of trustees and co-chairs of the search committee, introduced Taylor at a press conference April 17 following his election at a meeting of the board the previous day. 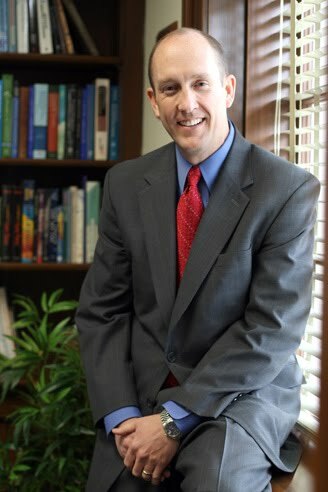 Taylor joined Samford University as dean and professor of economics for the Brock School of Business in 2005 after serving as associate dean for research and faculty development for the Hankamer School of Business at Baylor University, where he was also the W.H. Smith Professor of Economics. He earned his undergraduate degree from Baylor with majors in economics and finance, and he received his M.S. and Ph.D. in economics from Purdue University, in West Lafayette, Ind. In 2002, he was appointed a visiting scholar by Harvard University; he spent one year in residence at the Harvard Graduate School of Education pursuing research interests. As dean, Taylor has led the rapid transformation of Samford's Brock School of Business, spearheaded by a commitment from Harry B. Brock, Jr., founder of Compass Bank, to build a $100 million endowment for the school. In addition to his fund-raising efforts, Taylor has led the Brock School to establish eight new academic programs. The Brock School's entrepreneurship program was recognized in 2010 as the nation's top emerging program by the U.S. Association for Small Business & Entrepreneurship. As a scholar, Taylor has published studies in a variety of economics journals. Illustrating his diverse research interests, Taylor has also published articles on his research in public health and child developmental psychology. His research has been cited in testimony given before the U.S. Congress and the California State Assembly, and has also been referenced in publications such as The New York Times and The Boston Globe. Taylor currently lives in the Birmingham area with his wife of 17 years, Julie, and their three children, Zachary, Lauren, and Chloe. Taylor says he was drawn to Whitworth's strong sense of community and to its mission to uphold both rigorous, open intellectual inquiry and a commitment to Christian conviction as complementary rather than competing values. "Whitworth stands out as a leader among Christian universities because it is courageous in its quest to nurture the life of the mind and to engage society's important issues," Taylor says. "Whitworth navigates the world of academic inquiry and faith with real integrity. The university recognizes that the road it has chosen, which I believe to be the most exciting and inspiring way, is also fraught with complexity and difficulty. It responds by courageously embracing that challenge, and by asking itself how it can best contribute to the intellectual, spiritual, and moral development of its students." Taylor says he is encouraged by Whitworth's current position in higher education and he is excited about its trajectory moving forward. "So many universities, whether secular or religiously affiliated, are in a state of real identity crisis," Taylor says. "What excites me most about Whitworth's current position is that it is in a position of security and strength. My perception is that the Whitworth community isn't in an identity crisis; in fact, there is a sense of unity that is palpable. It is precisely because Whitworth operates from a position of strength and humility that the university can chart exciting and bold aspirations." Over the past two decades, the number of freshman applications to Whitworth has increased 565 percent to 6,397 for the coming fall; enrollment has grown 60 percent, to 2,781 students, amidst steady improvements in student academic profile and selectivity. Retention and graduation rates have reached record highs well above national averages. Meanwhile, more than $80 million in campus improvements have been made, including a new center for the visual arts, a landmark general academic building, three new residence halls and several outdoor athletics facilities, along with the new biology/chemistry building that is currently under construction. Financial support from alumni and friends has increased steadily, contributing to an increase of nearly $75 million in the university's endowment before the recent market downturn. Bill Robinson says he's confident Taylor will build on Whitworth's current momentum while holding fast to the university's distinctive mission and identity. Robinson says, "At the beginning of the presidential search, I think the committee members looked each other in the eye and said, 'Whatever grade we might get on everything else, let's make sure we get an A+ on mission.' They did. Beck Taylor understands how a university can be faithful to its Christian calling and committed to academic excellence in exploring a wide range of ideas." Michael Harri, student body president and a member of the search committee, says he was impressed by Taylor's vision for Whitworth and his genuine desire to get to know students and other members of the Whitworth community. "When we talked with Dr. Taylor about Whitworth's future, it filled me with hope and excitement about how he is going to lead Whitworth," Harri says. "I believe that in 10 years I'm going to be even more proud of my alma mater because of what Whitworth is going to accomplish under his leadership. On an interpersonal level, I was impressed with the time and attention he invested to get to know the members of the search committee. This is a person who will go to great lengths to connect with students and to listen to them." More information about Taylor and about the presidential selection process is available at www.whitworth.edu/presidentialannouncement. The presidential selection committee is grateful for the work of Academic Search, which assisted in the process of recruiting and researching candidates. Founded as Howard College in 1841, Samford University has more than 4,600 undergraduate and graduate students enrolled annually, making it the largest private institution in Alabama. Samford offers 26 undergraduate and graduate/professional degrees in eight academic schools: arts, arts and sciences, business, divinity, education, law, nursing and pharmacy. Samford holds fast to its distinctive Christian mission exemplified in the university motto: "Nurturing persons for God, for learning, forever."